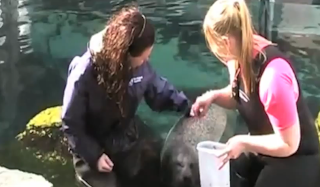 Video: Take a Dip with the Harbor Seals! Good news seal fans! The Aquarium's new Take a Dip with the Harbor Seals program is up and running. We posted about this fun opportunity earlier, but now we have a web page devoted to the program and we've made this video preview of what will happen when you come hang out with the seals. Get program details and find out how to book here. We'll see you with the seals!